Clearly showing the different DAF designs are the two Ormskirk pumps which were seen in the station yard, 7 April 2019. The photographs included in this website are subject to copyright, images may not be copied, printed or otherwise disseminated without express written permission of the owner. Under all circumstances, copyright remains with the original photographer or author. Remember that copyright is protected under international law. Full details of new additions to the site will be posted on this page with links where appropriate. As promised, I have undertaken a complete overhaul of the Greater Manchester section of the website, and all appliance pictures are up to date and at the relevant stations. I have not included Cadet appliances or Reserve appliances based at specific stations. Please note that the Turntable Ladder for Stretford is not yet on the run. I am grateful for the help I have received both from the F&RS and from friends who have assisted by sending me high quality pictures, where I have not yet had pictures of my own. Please note: I am currently in the process of doing a complete update on the Greater Manchester Section to include all the hand-downs since the arrival of the new appliances. I hope to have this completed quite soon. The appliance pictures on the Stretford page have been updated. In addition to the above the Whitehill page has been updated. I am grateful to Stephen O'Neill who has kindly forwarded an intersting picture which has been added to the Toxteth Library Page. Finally in this update, another historical picture from Peter Williams, this time featuring the former St. Helens C.B. Land Rover. I have added a set of photos from the fire at the derelict Ivybank School in Padiham last Sunday, and also added a picture of the new pump for Leigh. Following a major fire in Adlington, Lancs., overnight, appliance pictures on the Blackburn and Penwortham pages have been updated. I am most grateful to all those who are trying to find pictures of appliances not previously included on the website. In this update, my thanks to Aidan Fisher who has supplied pictures of the Lancashire County/Cheshire County Fords based at Widnes from 1972. Peter Williams has very kindly sent in a picture of the former Hatton Garden Dennis F12 which was converted to a Recovery Vehicle. Finally, bringing us back to the present again, sincere thanks to Ken Brown for a picture of the Merseyside IRB which has been added to the River Mersey page. The SACU page has been updated to include the new Unit for Cheshire FRS and a better picture of the Lancashire Unit. Appliance pictures have been added/updated to the Agecroft, Lymm, Moss Side and Salford pictures including a new appliance at the latter station. The picture of the Sale Foam Unit has been updated. I would like to begin this first update of 2019 by wishing all visitors a very Happy New Year. I am most grateful to Ben Earlam who has kindly supplied a picture of the new appliance at Whitehill. From my own pictures I have updated appliance pictures on the Garstang and South Shore pages, including the new Hose Layer at the latter. Following an RTC round the corner from my home, I have updated appliance pictures on the Atherton, Hindley and Leigh pages. Wishing all visitors to this website a very HAPPY & PEACEFUL CHRISTMAS. Special thoughts of those members of the Emergency Services who will be working today to keep us all safe. THANK YOU. A routine appliance picture update following a couple of incidents over the weekend. With new appliances on the run around GMC, I have done a major update of the movement of appliances to other locations. I hope to bring pictures of the remaining new vehicles very soon. More new appliances will enter service in the New Year. I am very grateful to Danny Jones who has kindly pointed out an omission on the website. GMC ALP N375YNC was not shown or listed in any index. I apologise for this and have added it to the Whitehill Library page as according to my records it spent most of its working life there. These appliances were moving into reserve at the time I was developing this website, and so moved around a lot. I have left N377YNC on the same page. Apologies for the lack of updates in the last month.This is due to another period of illness, but as I am now recovering, I hope to catch up again soon. 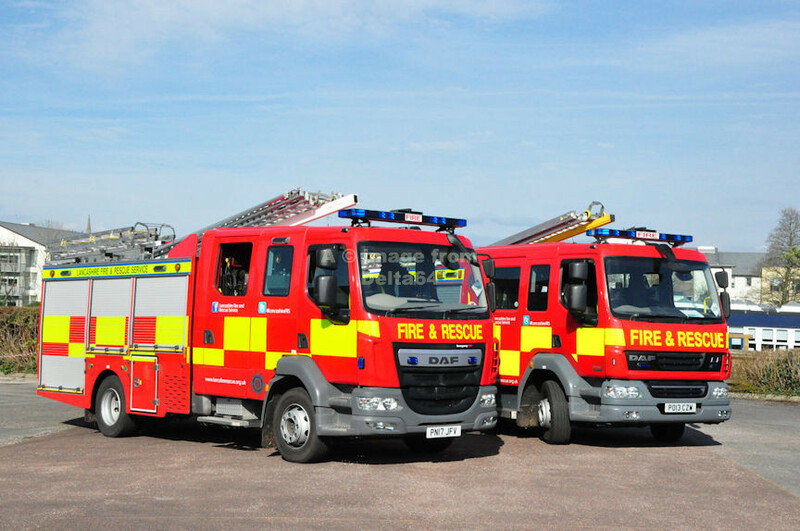 I am most grateful to Mark Eley for pictures of 3 new GMFRS appliances taken at the stattions to which they should be allocated. These can be found on the Bolton Central, Manchester Central and Stretford pages. I am also indebted to Peter Williams who has kindly sent another historic picture which has been added to both the Ashton-under-Lyne and Stalybridge Library pages. In this update I have included two more '67' registered appliances with Merseyside currently at Liverpool City and Wallasey. A number of pictures of mainly new vehicles has been added with one or two older ones for good measure. In Lancashire the 'new' SACU has been added, plus the missing '17' registered appliance based at Ormskirk. A picture of Lancashire's 'rainbow' appliance has been included on the Nelson Library page. Over in Merseyside I have added one of the new Scania pumps based at Southport, along with the CPL there. A number of '68' registered appliances are now on stations around GMC and should be entering service imminently. Meanwhile the Manchester Miscellaneous page includes record shots of some of the next batch of new pumps plus both the 32m and 42m turntable ladders. The picture of Salford Fire Station has also been updated. The Fleetwood page has been updated with the addition of the '17' registered appliance. An appliance picture has been updated on each of the Kendal, Penrith and Wigan pages. This update begins with a picture of two Mercedes of the former Liverpool Salvage Corps, and a colour picture of the former Cheshire Foam Carrier at Altrincham. Many thanks to Peter Williams for those pictures. There has been a complete revision of the Lancaster page, including an interim picture of the new fire station. Up the road in Morecambe, a new ALP will shortly be entering service, and I have included a picture of that. Finally, an updated picture of the RRU has been added to the St. Annes page. The Nelson page has been updated with the most recent appliance added. As ever, there was a good selection of appliances on display at the Annual Open Day at Irlam Police, Fire & Ambulance Station. Updated pictures appear on the Irlam and Stretford pages and the Rochdale C.B. Library page. The first of 3 new Catering Units has gone on the run. Based in GMC I have added a picture to the Chadderton page and others to the SACU page. Following an incident in Wigan last night, I have also updated appliance pictures on the Atherton, Hindley, Leigh and Skelmersdale pages. An additional 'over the border' picture has been added to the Alsager page. Station pictures on the Macclesfield, Poynton, Bollington and Offerton pages have been updated. Another 'old and new' update. The oldest of the SACUs, J269TTX has been donated to the Emergency Service Museum in Sheffield. I have now created a SACU Library Page as the former GMC vehicle N665WVR has also been withdrawn. 3 new SACUs will be going on the run imminently and pictures will follow in due course. The first new Turntable Ladder for GMFRS has arrived, along with 2 new Volvo pumps. Pictures of all 3 new appliances have been added to a new Miscellaneous page. Before the main update, it is with sadness that I have just learned of the death of Neville Jones, the last surviving wholetime fireman from the original group dedication of this site, to those who served at Newton-le-Willows in 1967. R.I.P. I have now created a series of 15 new pages under the general heading of Mutual Aid. These pages particular cover the period between late June and early July when mutual aid was received in the North West from Fire & Rescue Services across the country. Additionally the following pages have also been updated. Although the moorland fires are not yet fully extinguished, hopefully the worst is now over and I have had a chance to go through all the pictures I have taken over the past few weeks. I have prepared just over 150 to go on the website, most of which deal with the exceptional conditions that have taken place here in the NorthWest. It will probably take another few days before I can do the upload, but in the meantime it's not too early to express sincerest thanks to all the fire-fighters from near and far who worked in blistering heat and on difficult terrain to bring these incidents to a succesful conclusion. We salute you! Just a quick update. As you will all be aware, there are now a number of serious moorland fires in the Greater Manchester/Lancashire areas. First and foremost our thoughts are with all our firefighters working in such arduous conditions and in extreme heat. STAY SAFE. I am busy gathering as many pictures as I can. It is impossible to cover everything, but when, eventually everything calms down, I hope to have quite a selection of pictures to post. It may be to do with the recent hot weather, but there seems to have been an increase in serious incidents over the past few days. On Saturday as I was driving into Bolton I noticed a column of smoke which turned out to be a four pump fire less than 2 miles away. I have created a new incident page. On leaving that incident we noticed the new TRUs from Leigh coming behind us on the blues - pictures added, and then it was off to Ashton-under-Lyne to see their TRUs. As we left the house in the evening, we saw another large plume of smoke in the distance which turned out to be a pallet yard in Irlam, for which another incident page has been created. On Sunday, the SACU was called to Darwen and a 6 pump fire involving several tons of waste. Finally, and outstanding incident from earlier this month involving a derelict school in the Vauxhall area of Liverpool. In some cases, I have used appliance pictures included on incident pages to update the station pages. Full list below. A selection of pictures of one of Greater Manchester's new Technical Rescue Units has been added to the Leigh page. Following a recent trip into Cumbria, I have been able to update fire station pictures on the Egremont, Maryport and Whitehaven pages. New '67' registered appliances have been added to the Whitehaven and Warrington pages. Following on from the previous update, Peter Williams has kindly sent a picture of the Malpas F38 at the incident in North Wales. It's always good to be able to add pictures from days gone by of appliances not previously featured. I am grateful to Peter Williams for a picture of the former Cheshire Land Rovcr which has been added to the Malpas Library Page. A large moorland fire in the Goyt Valley was visible for many miles against an otherwise cloudless sky last evening. Although just over the border from the area normally covered by this site, I have included it in the Incident Library as 2 appliances from Cheshire F&RS were in attendance. The appliance pictures on the Macclesfield page have been updated. Ten days ago there was a major fire on the moors near Dovestones Reservoir, east of Oldham. I managed to photograph many of the appliances that attended and the following pages have been updated. I attended the annual Transport Festival in Sandbach, where a Scania has recently replaced the Mercedes Atego, whilst in the Merseyside section I have created a new page for the Prescot Community Fire & Police Station. Finally, the Carlisle East page has also been updated to include one of the new Volvo pumps. It is with great sadness that I learned this morning of the death of Arthur Collier who did so much in the early days of this website, to provide historical pictures, and who went on to become a very good friend to me and to my family. On leaving school in 1960, Arthur went to work at what was then the Lancashire County Council workshops at Worsley. At that time, all types of county vehicles were serviced and repaired there. In 1974 it became the Greater Manchester Fire Service workshops until the move to the current premises in Leigh. Arthur's speciality was aerial appliances, and he was an expert in this field. He remained at workshops for the whole of his working life until his retirement. He was unmarried. Our condolences go to his sister, Evelyn and brother, John. May he rest in peace. Following a mill fire in Brindle earlier today, a number of appliance pictures have been updated, including 3 appliances not previously featured. In addition I have added an updated picture of Carnforth Fire Station. I am trying currently to stay on top of recent material. Acccordingly I have updated the Fire Station picture on the Brampton page and have added an additional picture to the Newton-le-Willows page. An appliance picture has been updated on each of the Cheadle, Ormskirk and the Rochdale pages. Finally, a selection of pictures from last night's warehouse fire in Dukinfield. I hope everyone had a good Christmas and that it is not too late to pass on good wishes for a Happy New year. With interviews taking place next Monday for a new incumbent, I hope it won't be too long before normal service can be resumed both at church and on the website. In the meantime, a mini-update, as I try to catch up from 2017. The Horwich, Lymm, Skelmersdale and Wigan pages have been updated, and an incident page with appliances attending a Recycling Centre in Bolton has also been added.